Some pulpits are simply a wooden stand to hold the preacher’s notes or the Bible. In other churches, a pulpit can be a hotbed of electronics that are all important to getting the Message to a crowd of people. Depending on your needs, the design of the church pulpit may need to have more interior shelves or a larger width. 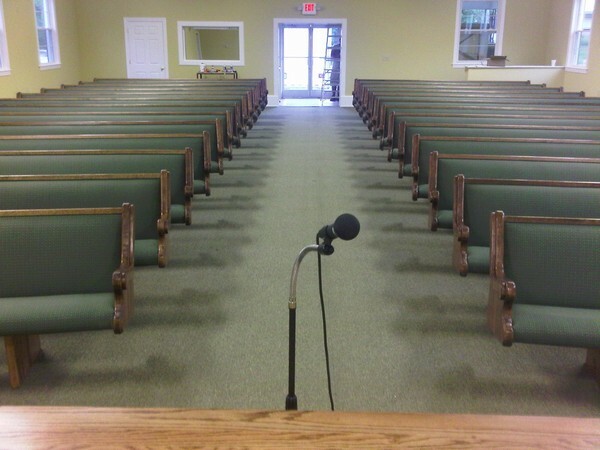 Custom church pulpits can easily accommodate special sound systems that need extra room. Churches both big and small have sound systems. While most people would think that a small church doesn’t need a sound system, they make it easier for everyone to hear and for the person speaking at the pulpit to do so comfortably without straining. Sometimes, the most powerful sermons don’t come from preachers with booming voices. Even out sound within the choir. No matter what your church’s size, having a pulpit that can accommodate a sound system or parts of a sound system shouldn’t be forgotten. Depending on your sound system, it might all originate from the electronics at the pulpit and then feed to the speakers throughout the sanctuary or it might go to a sound board where someone else controls the sound. For sound systems that have relays, not as much space is needed in the pulpit but you’ll still want to measure to make sure the relay system fits inside of your desired pulpit. If you have a complete sound system in your pulpit, giving extra room around it is also a good idea to ensure it doesn’t overheat. Wide pulpit designs like the one above right are best for large sound systems. This style, called the Chaplain, is one of the five standard styles we offer. 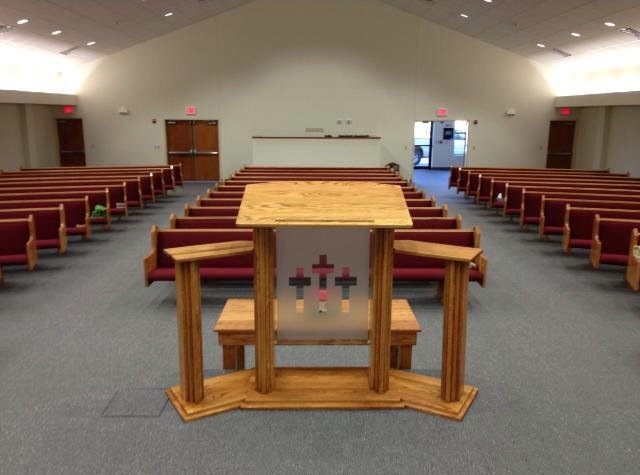 We can always make completely custom pulpits, however, to suit specific needs. 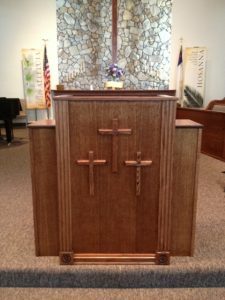 This pulpit at left is a completely custom pulpit that we built using special materials and a design just for that particular church. If you’re having us build a custom design, be sure to think about things like microphone wires, especially when incorporating glass and plexiglass into your design. No matter what your needs for your sound system at your church, we can build a custom pulpit suited to your specific church. Contact us today for a free quote.